Josh Wilker’s Cardboard Gods is the autobiography of a misfit told with the aid of his childhood baseball card collection. It is also a terrific book that you should rush out and buy immediately. Wait, who wants to read the life story of a misfit? 2. You have fond memories of opening up a pack of baseball cards. 3. You remember the 1970s. 4. You have a brother who played a big role in your life. 5. Your family did not resemble Ozzie and Harriet or the Huxtables. 6. You are a fan of good writing. Cardboard Gods starts off in 1973, when Wilker went from having two parents to three. This is where it helps if you remember the 1970s. But even if you do not, Wilker explains the circumstances of how he went from having a mom and dad to having a mom, a dad and a Tom. Eventually his family moves to Vermont, where you think people would be more accepting of a liberal lifestyle, but for young Wilker his childhood was anything but easy. And the rest of the book is about his life, and how both baseball and baseball cards played a pivotal role in his ability to cope. It is a story that is hard to imagine happening today, yet still contains the timeless ingredients of sibling love, parental alienation, loneliness, failure and redemption. It is every bit as much of a family memoir as it is about baseball cards. And baseball is found on every page. There are over 50 baseball cards (and a basketball one!) depicted in the book and each card, whether it be a star like Johnny Bench, Reggie Jackson or Tom Seaver, or a stiff like Rudy Meoli or Carmen Fanzone, serves as the jumping off point for another episode of Wilker’s life. In 2006, Wilker started his own Web site, where he pulled a card from his collection, which mainly ran from 1975-1980, and wrote about it. These entries could be about the card, the player or Wilker’s life. Frequently they were about all three. The descriptions were spot on and the writing was clever. And while the initial hook was a chance to reconnect with some old baseball cards, what kept readers coming back again and again was the other stuff. His site became a must-visit for a large number of people, who all wanted the same thing – a bigger audience for the author. Time and time again, people would express their joy in reading Wilker’s work and ask him when the book was coming out. One of the great things about Wilker is his willingness to engage with his audience. He let us know that he wanted to write a book, too. He just needed a publisher. Seven Footer Press stepped to the plate. 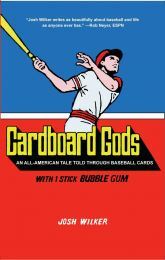 The full title of the book is Cardboard Gods: An All-American Tale Told Through Baseball Cards. The book is an extension of the Web site, meaning that Wilker uses the cards from his childhood to tell a story, his story. He has rewritten earlier posts and come up with new entries and the end result is a fascinating story that becomes impossible to put down. How good is the story? Eventually you stop caring about the baseball cards on the pages. Well, that’s not entirely true. At the beginning of the book, you are drawn to the cards for a visual clue as to what to expect on the following pages. By the end of the book, you skip over the card because the story has zoomed past the part of needing visuals. Instead, you turn back to see the card that started the latest episode. Wilker’s life has been neither simple nor ordinary. And while I have no doubt that during parts of his existence he would have described his life as terrible, Cardboard Gods is ultimately a story of triumph. When Rob Neyer sings your praises, as he does on the cover, you know you have done something right. The 243-page book goes on sale nationwide on April 12th with a list price of $24.95. You can order online from the usual places. Members at Barnes and Noble can buy it for $17.96 while it can be purchased at Amazon for $16.47. Those looking for more information on Wilker and what to expect from the book should check out his Web site. And for even more information, you can view this Q&A I did with him back in 2008. We hoped you liked reading Review: Josh Wilker’s Cardboard Gods by Brian Joura! Just looking at the cover has me interested in reading this. I loved the 70s Topps card wrappers.